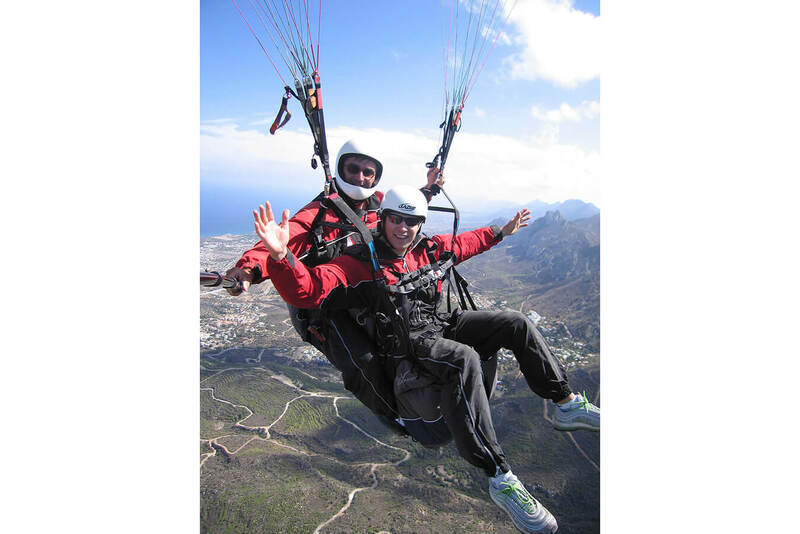 Paragliding Tours are offering tandem paragliding flights and single pilot transport and guiding with paragliding equipment, as well as aerial photography. 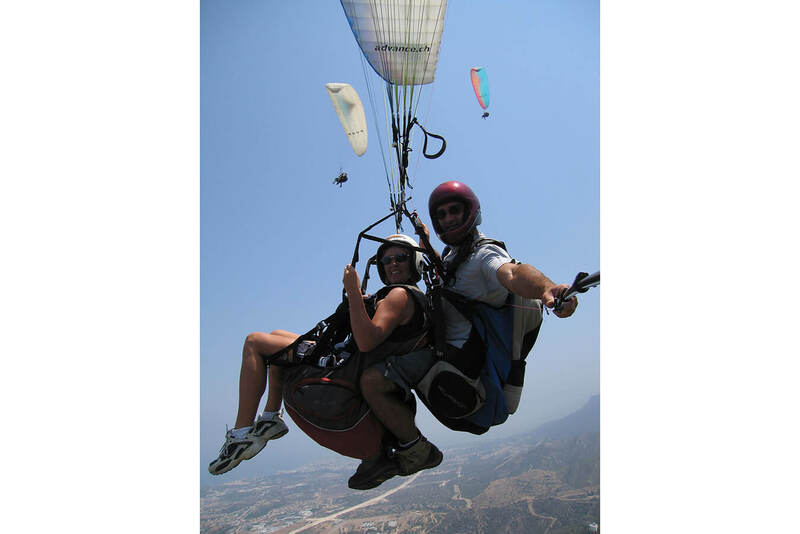 It also offers a professional and safe approach to all aspects of paragliding. Our take off is at 2500ft. / 750m, to the west of St.Hillarion castle, giving you uninterrupted views of the stunning five fingers mountain range. After an easy take off involving a few steps down a gentle slope, you will be treated to the spectacular view of the unique scenery of Northern Cyprus. Whether you want a gentle scenic flight or with an adrenaline joy ride over the landing site, your pilot can tailor your flight to suit what you would like. Allow a maximum of two hours for the whole adventure. Photos, Videos & T-Shirts available. No training is needed; your pilot will guide you throughout your flight and provide you with clear instructions about take-off and landing. All our Tandem Pilots and customers have extra medical insurance, in accordance with North Cyprus aviation laws. 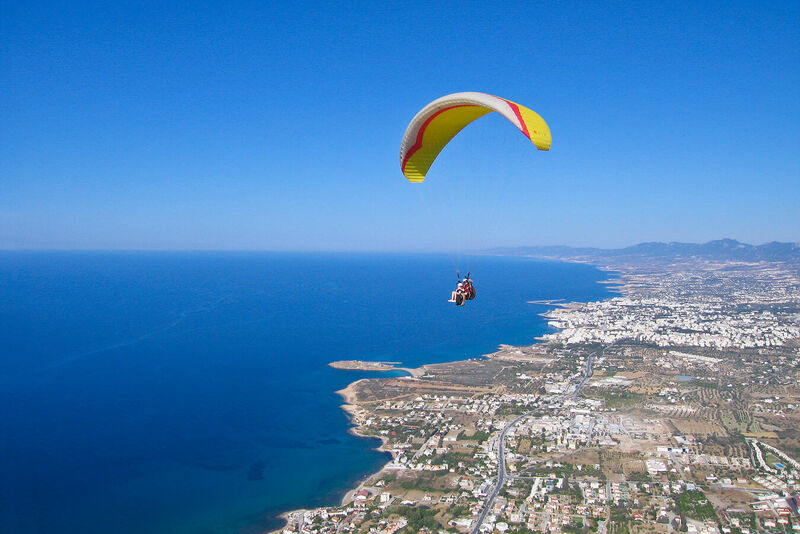 Your flight will end after we land gently and controlled on the Kyrenia coast. We fly everyday weather permitting, but best not leave it to your last day of your holiday. North Cyprus has a growing number of single pilots of all nationalities who fly regularly with us. We offer a service for single pilots wishing to come to North Cyprus either by themselves or as a group. We can offer transport and any guiding needed, also we can help with accommodation and equipment rental. All pilots must contact us before flying with copies of Licenses and Insurance, these need to be given to the authorities which we will organize the same day. Pilots also have to take a short briefing about air space and other restrictions. 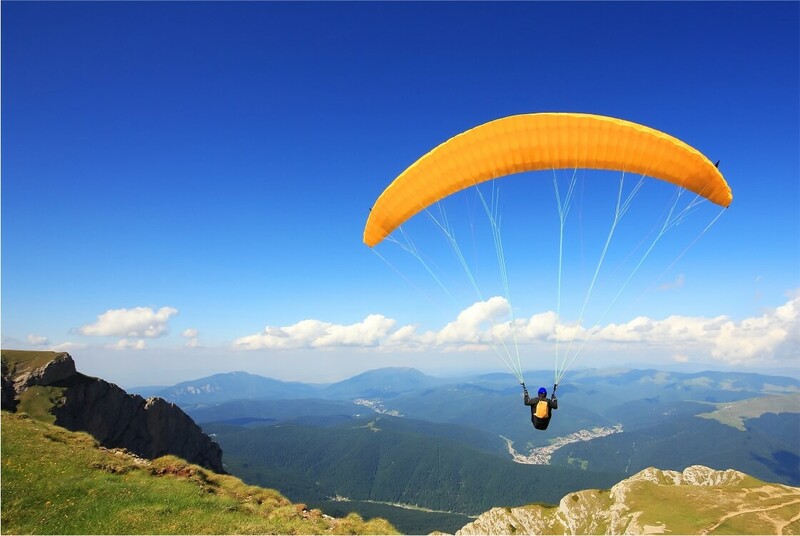 All pilots will need to have full medical insurance covering Paragliding not just 3rd party, as well as at least 20 hours flight time since obtaining Club Pilot rating or its equivalent. The weather in Cyprus is pretty reliable and most days are flyable especially in summer, we have soft thermals and a large landing field for those who like a lot of space when landing. We go to the mountain four times a day, our take off sites are gentle slopes with easy take offs.